Have you recently heard people talking about being over-acidic, measuring their pH and eating alkalizing foods? 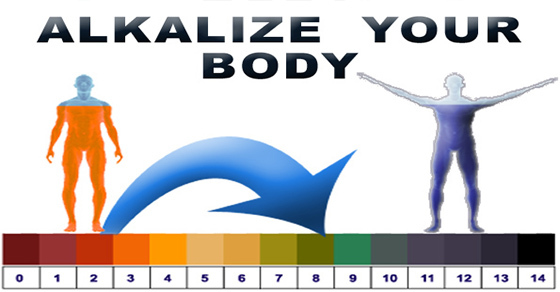 Emphasizing the importance of body’s pH might seem like a new fashion, but the science and art of pH balancing has had a long tradition and, unlike some other trendy theories, it has successfully overcome the test of time. In terms of chemical understanding, pH is a measurement of hydrogen ion (H+) concentration in a solution. Solutions with low hydrogen concentrations have high pH values, and solutions with high hydrogen concentrations have low pH values. 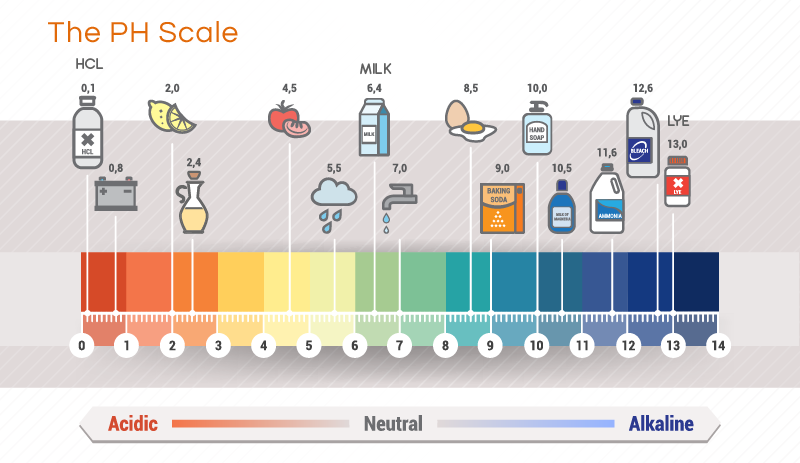 As you probably remember from school, the pH scale runs from 1 to 14, with 7 representing the pH of pure water – neutral. 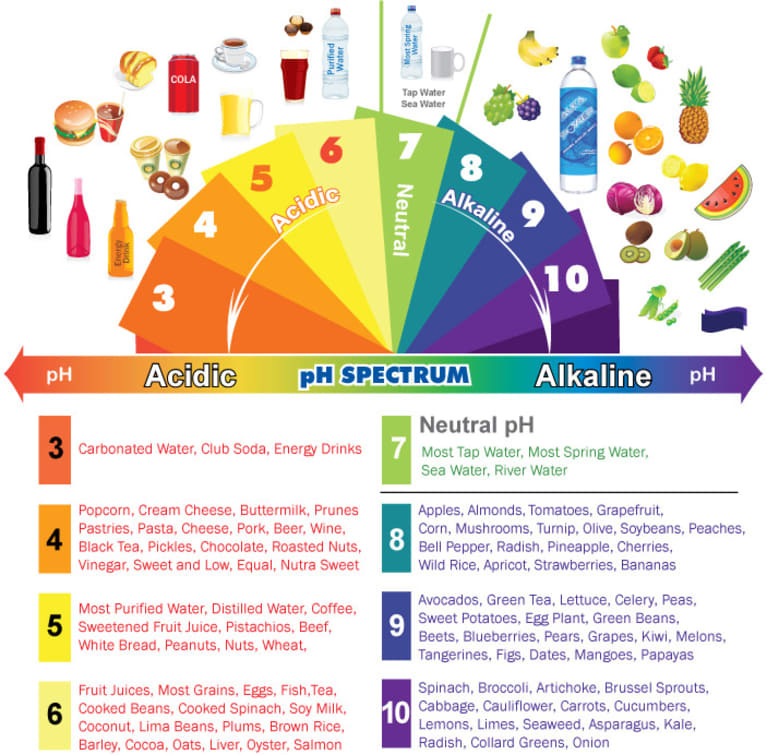 Above 7 is alkaline, below is acidic. 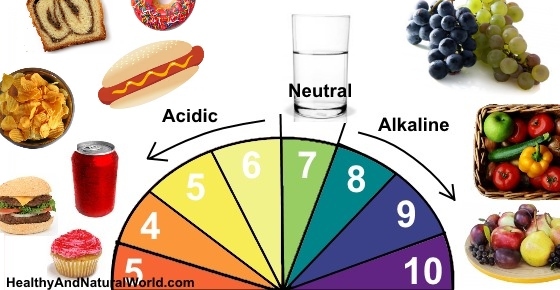 In optimal circumstances, your body should have a pH of between 7.0 and 7.4, so slightly alkaline. This refers to the pH of the body’s main fluids: blood, lymph and cerebrospinal fluid. The pH of the digestive system however, is a bit less uniform: the mouth, pharynx and esophagus are all slightly acidic with a pH of 6.8; the pH of the healthy stomach is 1.3 – extremely acidic; the pH of the small intestine resembles that of healthy bodily fluids; and in the colon it ranges between 5.5 and 7. In 1931, Dr. Otto Warburg won the Nobel Prize in physiology. He was the first to describe the correlation between the acidic environment and cancer cell growth. We know now that an acidic body is more susceptible to different diseases, including arthritis, cancer, and cardiovascular diseases. What’s more, if your pH is out of balance, digestive problems can occur and your body can’t assimilate the goodness from food, which can make you feel constantly tired. Blood pressure, insulin levels and cholesterol, as well as body weight and immune system function, are all influenced by changes in pH levels. As every one-point decrease on the pH scale means 10 times increased acidity, going from pH 7 to 5 makes your insides 100 times more acidic! This is not a good sign if you’re planning on living a long and healthy life. The bottom line is that you want to keep your body’s pH as close as possible to what nature intended it to be. Also, if you are aiming to cure a disease, you might want to start by looking at the pH of your body. When doing that, most people discover that they’re too acidic. Research suggests that an alkaline diet can assist with chemotherapy treatments, making the treatments more effective. This is the case for example with cucumber, which contains lignans that are being studied for treating estrogen-related cancers within the body. The Journal of Environmental Health suggests that “it would be prudent to consider an alkaline diet to reduce morbidity and mortality of chronic disease that are plaguing our aging population”. While there are no studies that directly show an alkaline diet to prevent cancer, research is ongoing. In general, the alkaline diet may assist cells and connective tissue in retaining water as it works to enhance systemic, brain, and bone health. Additionally, alkaline foods such as cucumber may provide the support needed for enhanced enzymatic function, to prevent degradation of tissues and slow cell aging. Presumably, an abundance of alkaline cellular reserves buffers the depletion that occurs when the body constantly readjusts to maintain proper pH and minimize cellular acidity. The main culprits of over-acidity are improper diet (fast food, high consumption of sugars, animal products and processed foods), stress and lifestyle choices, for example sedentary life style. Interestingly, over-exercising, especially too much cardio workout, can lead to a drop in your pH levels as well, as it contributes to stress. At first, the body tries to compensate and bring the pH back to its optimum levels. For example, minerals such as potassium, sodium, magnesium and calcium are taken from our vital organs and bones to counteract the acid. But this cannot go on indefinitely, and sooner or later the acidic environment starts to attract all sorts of ailments. She claims that all these turn your body acidic and make it inflamed. So you need to become more alkaline again. You can do this by eating foods that will bring you back to balance. The changes don’t need to be as complex as some might think. Boroch emphasizes that little can go a long way. Candida is very widespread due to the imbalanced lives we lead. Antibiotics and steroids are taken routinely, and everyone is overly stressed. All these factors contribute to candida overgrowth. Many times, candida goes undetected for a long time and weakens the immune system. Compromised immune system leads to genetic mutations. Some experts now believe that fungus is actually a form cancer, and that the two go hand in hand. Doug Kaufmann has written and lectured about the ‘fungal theory of disease’, in which he explains the role fungi has in disease development. Fungi should not be ignored, as they might be the key to solving many health issues. Ann Brooch herself believes that there is a strong connection between cancer and candida overgrowth. If you have candida, that is a clear signal your body is over-acidic. Often, anti-candida regimen helps with cancer treatment – it promotes the alkalinity in which cancer cells can’t survive. You can read my article about candida to discover the top signs you have candida infection and what to do about it. It might be a good idea to test your pH and find out where you stand. You can do this at home. All you need is litmus paper, which can be bought at a pharmacy or a health food store, and a bit of discipline. You need to dip the litmus paper in your first morning urine. Collect a sample in a clean container and measure the pH level. Or, you can use saliva, one hour before a meal or two hours after eating. Make sure you obtain a clean sample, so before spitting on the litmus paper, collect saliva in your mouth and swallow it. You might find it useful to keep a diary over a period of time, so you can compare the values and get a medium value. The pH of your saliva should stay between 7 and 7.4 all day. The pH of morning urine is slightly more acidic and fluctuates between 6 and 6.5. If you are also measuring the evening urine, the value should be between 6.5 and 7.